As the result of migration, many languages have a homeland variety and one or more so-called heritage varieties spoken in the countries of migration, often in Europe, North America, or Australia. One of these is Ambon Malay, a language originally spoken in the Central Moluccas, Indonesia, but also spoken as a heritage language in the Netherlands. When one language is spoken alongside another one, contact-induced change is expected to occur. This change inevitably leads a heritage language to diverge from its homeland counterpart and to converge toward the socially dominant language. This dissertation explores contact-induced change in heritage Ambon Malay, as spoken by Dutch-Ambon Malay bilinguals. 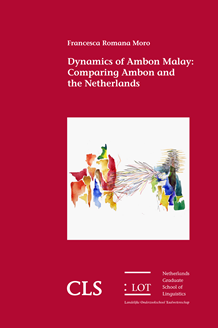 In order to investigate divergence and convergence, the present study systematically compares heritage Ambon Malay to its homeland variety, to Dutch, and to the language of first generation speakers in the Netherlands. The comparison, both quantitative and qualitative, is based on semi-spontaneous speech data and it focuses on four grammatical areas: nominal modification, aspect marking, give-constructions and resultative constructions. The most pervasive type of contact-induced change encountered in heritage Ambon Malay is ‘change in frequency’, namely a change in preference for one construction over another equally possible construction when the preferred construction is shared with Dutch. As a result, heritage Ambon Malay grammar is converging toward Dutch and diverging from the homeland variety. Beside Dutch influence, divergence from the homeland variety is also accounted for by the quantitatively and qualitatively different language input that heritage speakers have received in the county of migration.